That's a Hell of A Lot of Holiday! First order of business tonight - the giveaway for 10 copies of Pretty Hands & Sweet Feet officially ended yesterday, and all the winners have been emailed. Check your inboxes to see if you're one of the lucky 10! Second order of business is what you actually care about. Remember when I said I was going into full-blown holiday mode? I may have gone a little too far with these bad boys. I was feeling freakin' festive as I geared up for our spa's holiday party, and I wanted to showcase my nail art to some potential new clients. So I bummed around Instagram a bit, and came across some pretty great inspiration. First, a really great idea from @nailsbycambria for a holiday French. 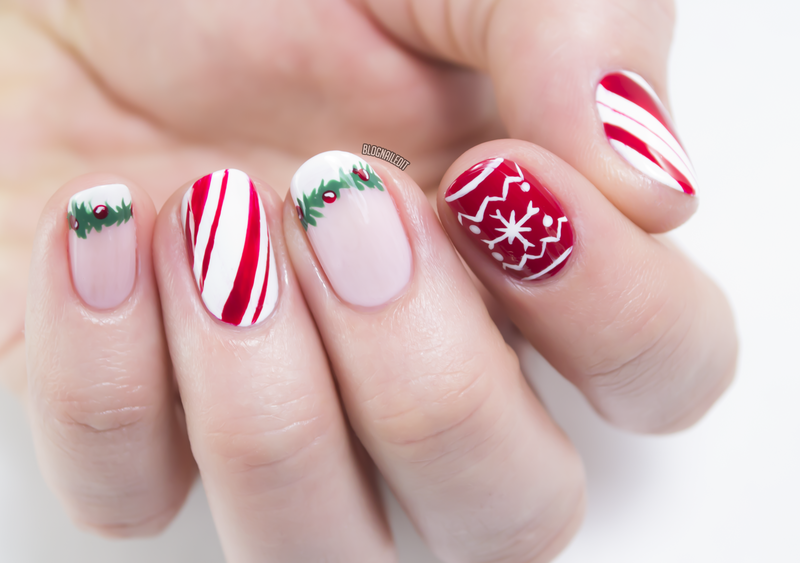 I didn't just want to do a French though, so I did a skittles mani with some candy cane stripes and a nod to ugly sweater season. The result is what I like to call "A Hell of A Lot of Holiday". I used a bunch of OPI polishes. I honestly pick OPI for a lot of my manicures because it's the top drawer in my stack of Melmers. Maybe I should rearrange drawers to switch it up. The colors used were Jade is the New Black, I Theodora You, Love is In My Cards (which is a new holiday color I'll be sharing swatches of shortly), and then I also used essie's Blanc. What holiday designs are inspiring you lately? I love these! The french tips are super cute!